Safe Haven manual tie downs are fabricated at our facility in San Fernando. Made from the highest quality materials, most orders can be shipped in 1-2 days getting you safely secured and back on the road again. Features S-hook for wheelchair attachment. These straps meet the minimum length (16" front and 19" rear) and maximum lenghts (28" front and 29" rear) specified when installed. Note: For kits or straps compatible with A-track anchorage, replace “L” with “A” in the part number. i.e SH2000L3B4B-KT becomes SH2000A3B4B. 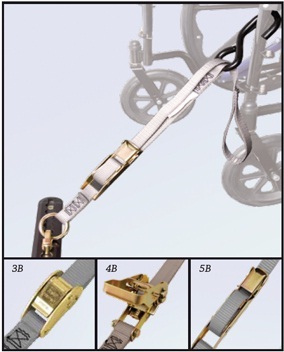 *Cambuckle straps are to be used for front securement only on forward facing wheelchair securement.